Janet McNamara sent this photo showing numbers 120 to 126. She adds 'The 'ghost' car is coming out of Boars Head Yard (between numbers 126 and 127 High Street) so it's after the front of the Magpie and Crown (no. 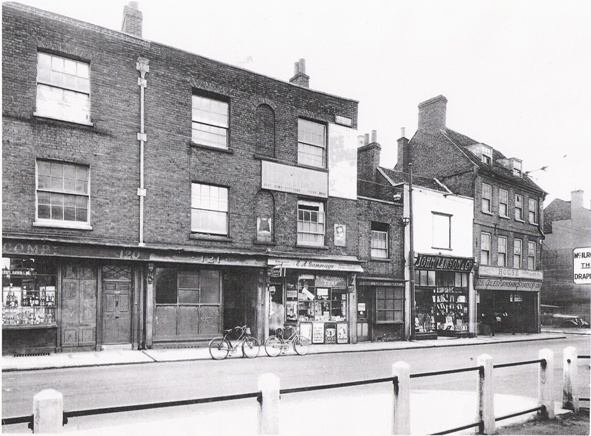 128) was moved back off the High Street and what is now only a footpath was once an access road'. The photographer was standing in the Market Place. Dating the photo was helped by Pauline Stanhope (nee Young) when she sent a photo of this area dated 1951. This shows prominent signage for the Old Vaults, 1647. It seems likely this dates from 1947, so would put the photo below, which lacks this advertising, at some date before then. Trade directory entries below confirm a 1940s date fits. The sign for McIlroys (at 129/130 High Street) is visible on the wall of no. 127 High Street. More about this area of the High Street and links to other photos. You can see the original photos, and many others of Brentford, by visiting Chiswick Library (please check opening hours).